My therapist asked me a question at the end of our last session: what makes you happy? I wasn't sure. Not even a little bit. I know what things I enjoy doing - how to have fun. But what is it that makes me happy? I've been thinking about that question ever since. The puppies and I were out in the garden working today. They don't make a very good work crew to tell the truth, but they are enthusiastic. Wally, the cranky Chihuahua, constantly tries to establish who is the Alpha doggie. Luna, the lunatic Pug puppy, lays on top of all the plants and tries to eat the garden tools. 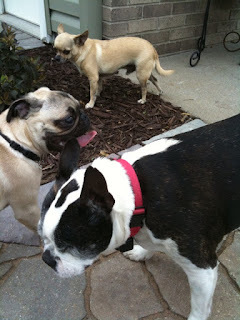 La, the one-eyed Boston Terrier, tries to be prepared for Luna's habitual pouncing. And they do all this right at my feet. We found some treasures outside this morning! 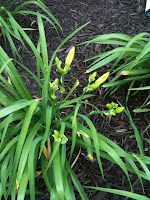 The day lillies are in three stages of development. 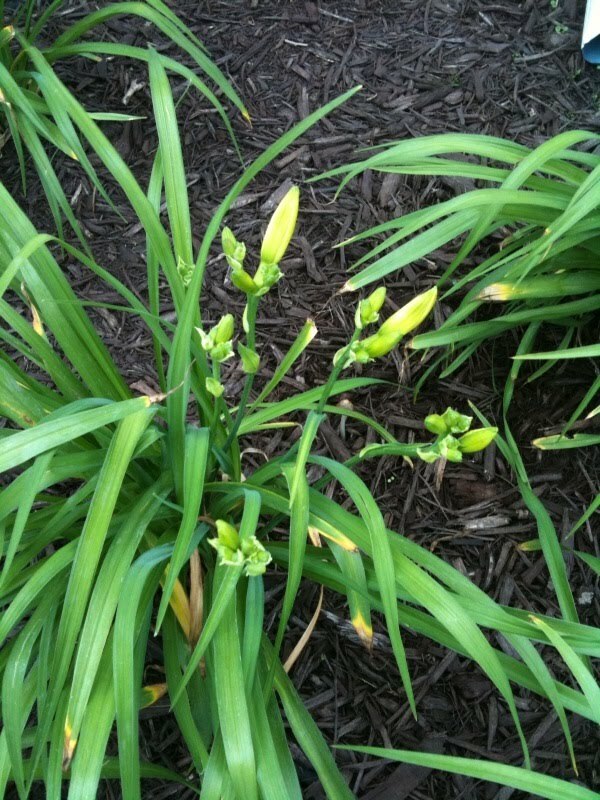 Some have early buds, some have buds about to burst, and one has the first bloom. They're beautiful. Then we checked the peonies. 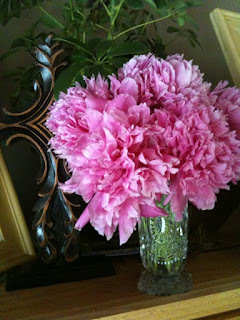 I'm going to have to study how to make peonies remain upright when the blooms are at their peaks. 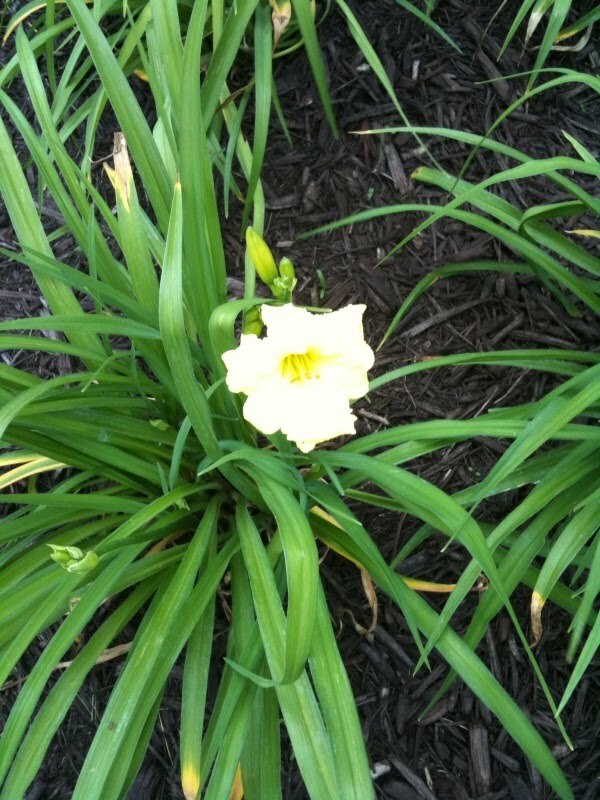 Bursting with color and fragrance, the heavy flowers bend the stems until the flowers are all on the ground. I saw someone using frames for them, so I think I'll have to find some. I don't really know much about tending them yet. I think it will be a worthy study. We harvested the blooms this morning and filled a vase before cleaning much of the petal debris from the mulch. 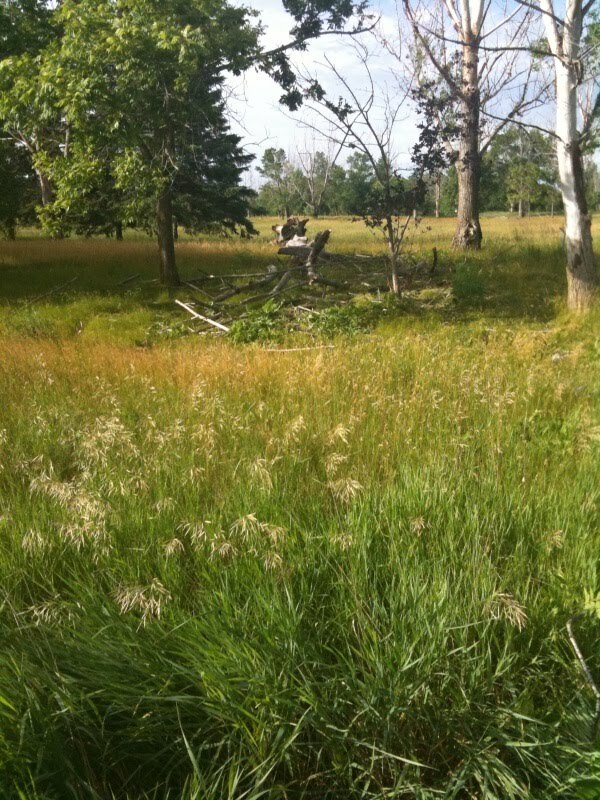 We found some storm damage to clean and some to observe on the golf course. The lunatic enjoyed the hike to look at the fallen tree the most. The other two doggies stayed home. 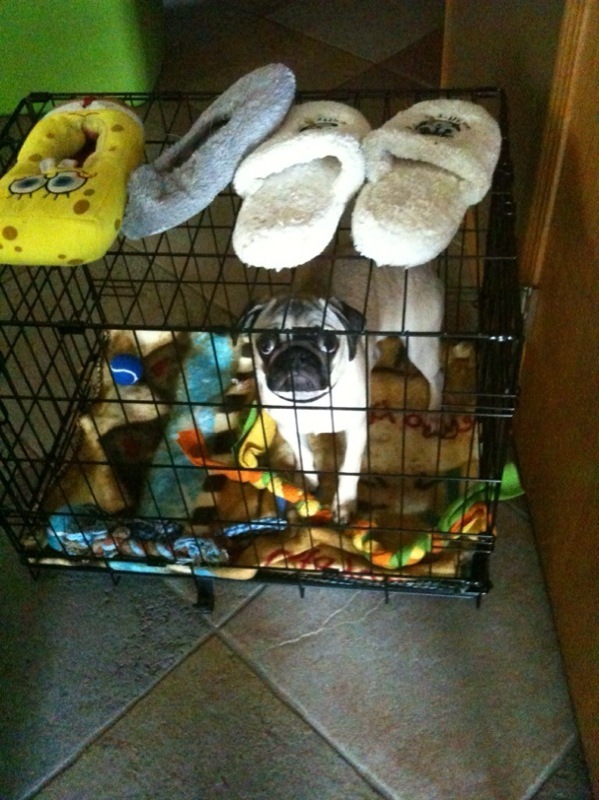 I've found the best way to manage a new puppy is to use her kennel. Luna is hilarious in hers. Trust me, she's not anywhere near as sad and pathetic as she looks. This was a happy day. I'm excited for Joe to get home and see all the changes in the yard and enjoy his doggies. He's going to love how the plants are growing. I also think he's going to enjoy the lunatic. I'm going to love having him home to help solve my weed problem and to help tire out the lunatic every day. Only two days to go. Helping friends makes me happy too. S's graduation party was a success last night and K's will be on Friday. All the work makes for healthy, healing sleep at night. The work itself is a joy; there's nothing better to lift spirits than being among women with a mission in a kitchen. 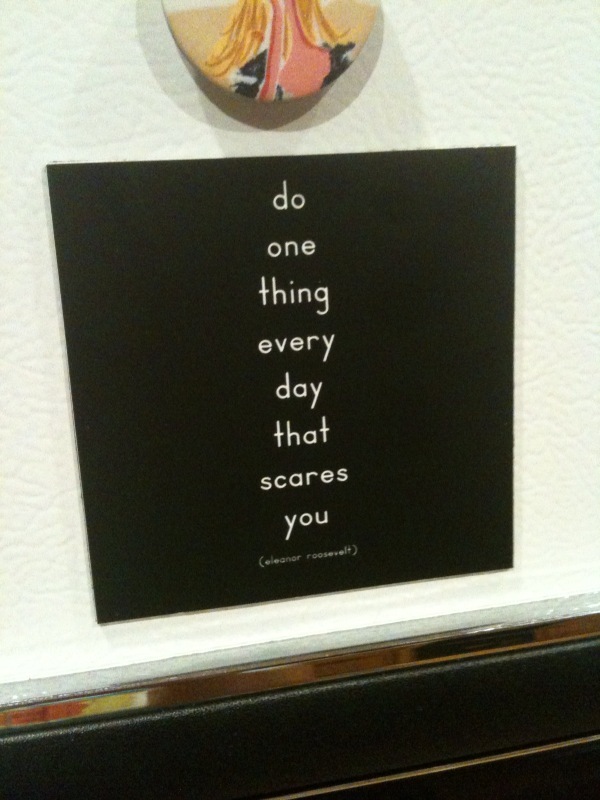 I paused briefly in front of my fridge this morning and saw my reminder magnet. 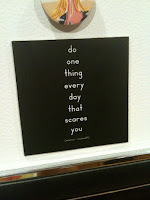 It reads "Do one thing every day that scares you." I did. I cleaned my car. Nearly too frightening for words, but done! Woot woot! I guess had I wanted to be completely terrified, I would have cleaned Adam's truck too, but lacked the courage to tackle that one today. I was able to open the doors and clean out the food wrappers and trash that have been sitting there this entire week. Smells like aging trash in his truck. Wonder if he'll enjoy the aroma when he returns home Monday. Off to celebrate more graduates!